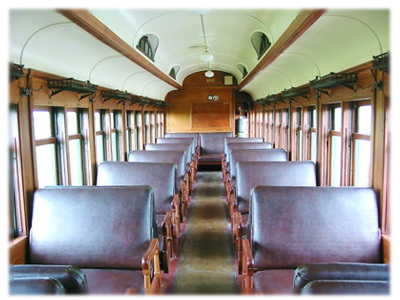 Coach 105 was built in 1901 by Barney & Smith of Dayton, Ohio for the Canadian Northern as their number 26. With a length of 65’8” it is of all wood construction, truss rods and four-wheel trucks. It is a first class coach with a smoker compartment and a capacity of 61 passengers. In 1904 it was renumbered to 108 and in 1915 to 8086. In 1922 it became Canadian National 3422. In August 1954, like Coach 104, it was sold to the Greater Winnipeg Water District Railway. Initially, it carried number 53 and later 353. In June 1970 it became Prairie Dog Central Coach 105. Coach 105 is the oldest of the Prairie Dog Fleet. It was the second of an order for four coaches (25-28) purchased to serve on the newly completed Canadian Northern line from Winnipeg to Port Arthur, Ontario on Lake Superior. This was the first order for new coaches ever placed by the CNoR, which makes 105 just the second coach to carry ‘Canadian Northern’ on its letter board. All their earlier coaches, twenty-two in all, came from existing lines the CNoR took over. The same month she was sold to the GWWD, coach 28 (then CN 3423) was scrapped in Winnipeg; a fate 105 could well have shared. The opening of the line to Port Arthur in 1901 was a significant event, not only in the history of the Canadian Northern but in the whole development of Western Canada. For the Canadian Northern it was a major step in its evolution from a handful of disconnected short lines to a unified and viable mainline railroad that eventually ran from Montreal to Vancouver. For Western Canada it provided farmers with an alternative to the CPR for the shipping of their grain. For fifteen years grain growers, mostly in Manitoba, had chaffed under what they saw as a cruel and oppressive monopoly, sometimes being charged more to ship their grain than it would earn on the market. In their eyes, the CNoR was a heaven-sent savior and the little-mixed train to Port Arthur a symbol of that salvation.